I know, you’re probably thinking you haven’t blogged in months and this is the recipe you come back with? Granola? Yes, granola. When it comes to food, I thrive on variety. In spite of the ease of it, I will never be one of those people that eats the same breakfast or lunch everyday. I’m always trying new recipes and rarely even make the same dinner twice in one month. If I come back to a recipe repeatedly, you know it’s a good one. 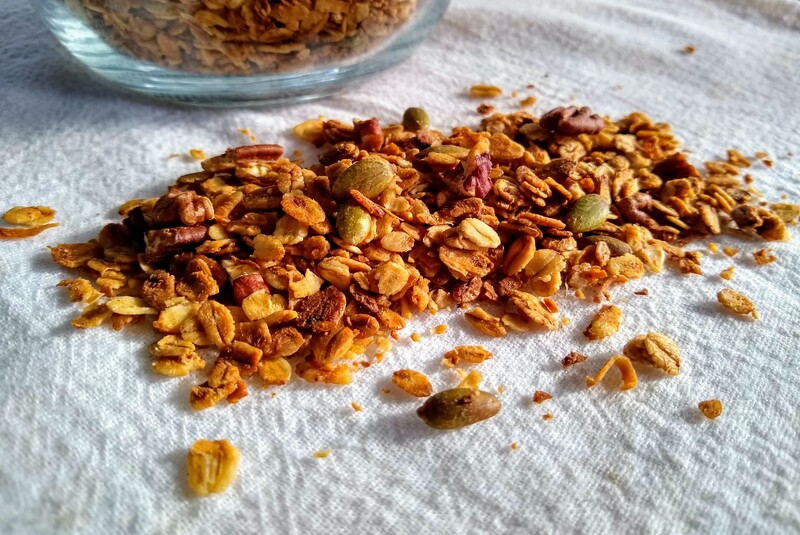 I’ve been making this granola for years now and lately it’s become a weekly thing. 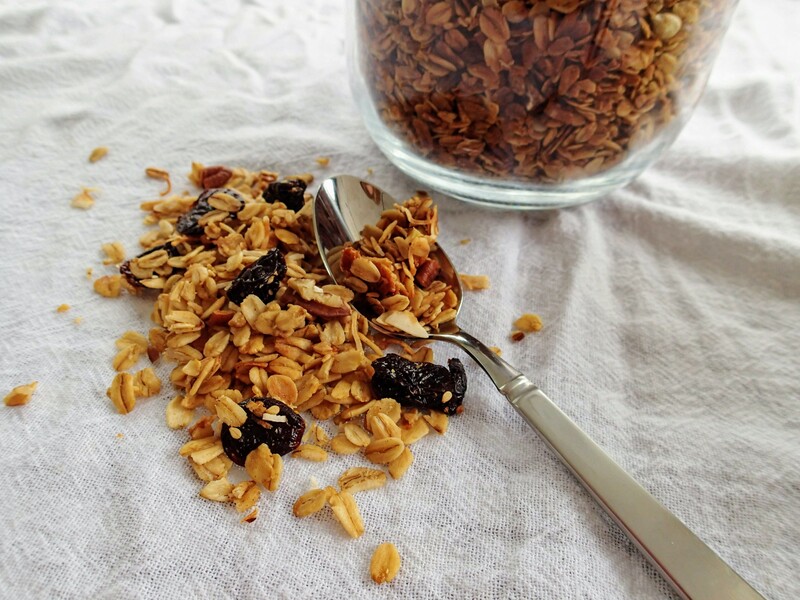 This granola is also one of the only things that everyone in our family will eat. The granola is easy to make (ie minimal dishes), infinitely versatile, and a million times better than anything you can buy at the store. If your pantry is stocked like ours, you can also make it with things you have on hand, eliminating any special grocery shopping trips. The granola is a great way to jazz up yogurt (or this coconut chia pudding) and parfaits, but also is good enough to stand alone with a bit of milk. Some people in our family even eat it by the fistful straight out of the jar. This granola is easy to make, infinitely versatile, and a million times better than anything you can buy at the store. 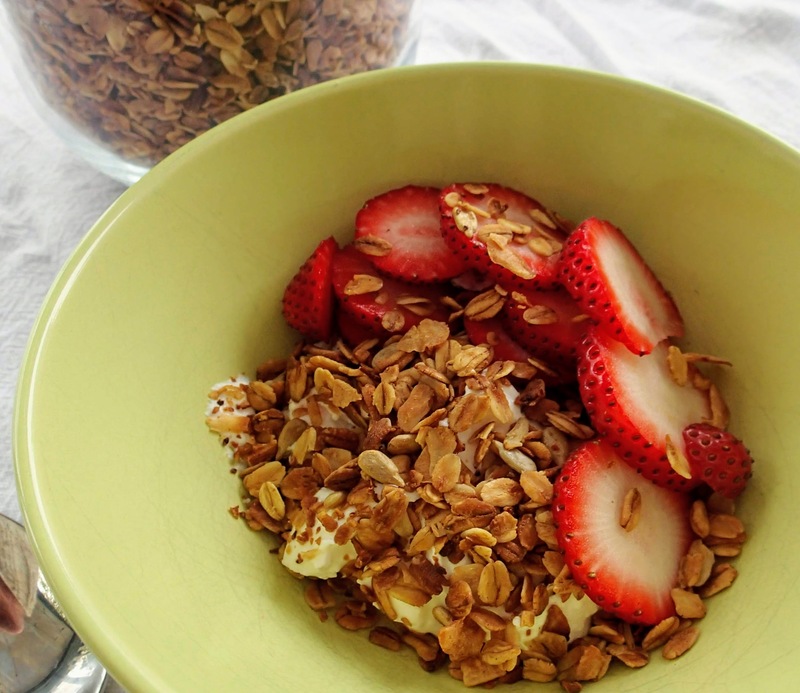 It's the only granola recipe you need. 1/4 Cup seeds We've used sesame, sunflower, and pepitas with great results. Preheat oven to 350º F. Line a large cookie sheet or jelly roll pan with parchment paper or a silpat mat. Pour the oats, seeds, pecans, and coconut on the pan. In a one cup, or larger, liquid measuring cup measure the oil, honey, and then the maple syrup. (The oil and the honey are easy since they get you to the 2/3 C line. When I add the maple syrup I measure halfway between the 3/4 C and 1 C line. You could measure it separately, but I'm always trying to minimize bowls.) Add the water, vanilla, cinnamon, and salt. Whisk or stir together. Make a well in the center of the dry ingredients. Pour the liquid into the well. Stir until the mixture is evenly distributed. Spread evenly across the pan. Cook for 10 minutes then stir. Cook another 10 minutes and stir again. Put the granola back in the oven for a third time. Check at 7 minutes for doneness. If it isn't golden brown yet, cook for 3-4 more minutes checking every minute until desired crispness is reached. Allow to cool. Add dried fruit if desired and store in an air tight container. Adapted from Artisan Bread in Five Minutes a Day.